Here's my Visual Mihi for 2014, it holds the 4 symbols that represent me. The very first symbol is my prefects badge, the reason why I put this as a symbol is because it represents my school and my role as a prefect. The second symbol is of my hobbies. Now you may not see all of the things that I drew in the column, but in my spare time, I like to go on Youtube or read and write. Thirdly is one of my favourites. This one, as you can probably tell is of my culture. I interputed it by drawing the flag, some patterns and the quote from the four of arms. "Ko e ʻOtua mo Tonga ko hoku Tofiʻa" which means in English: "God and Tonga are my inheritance"
The last symbol is my religion. I am Christian and it plays a big part in my life style and family. I drew the cross, the bible and the communion bread. 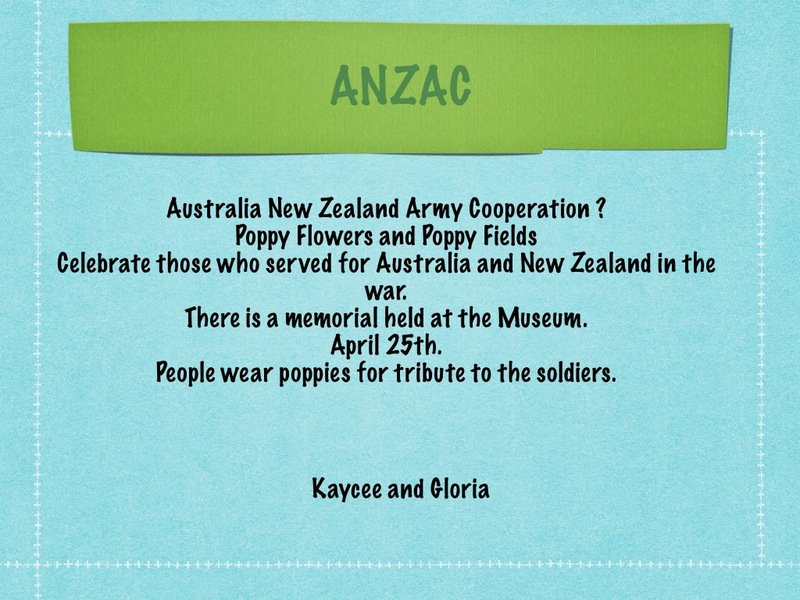 There following is a brainstorm of things that Kaycee and I thought of when we were asked about Anzac. 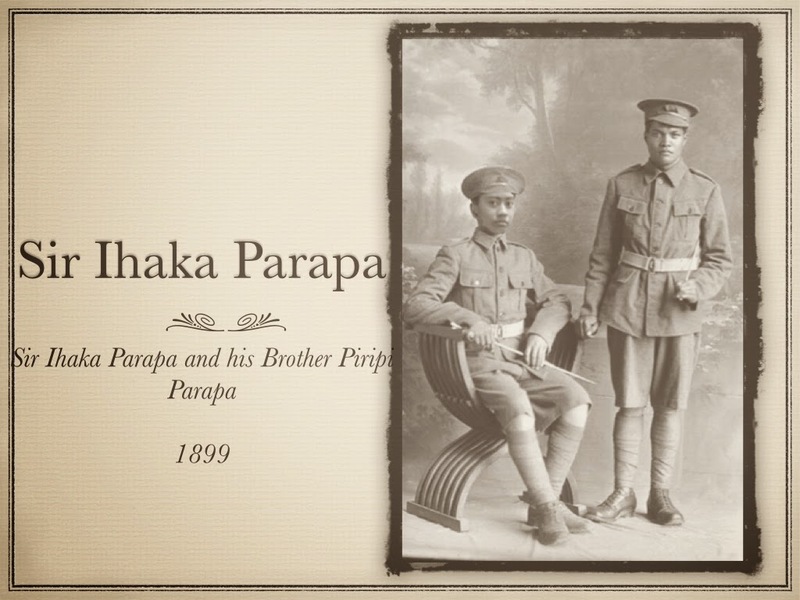 In Extension, we learnt about a war that New Zealand participated in. The Boer (pronounced BORE) War. 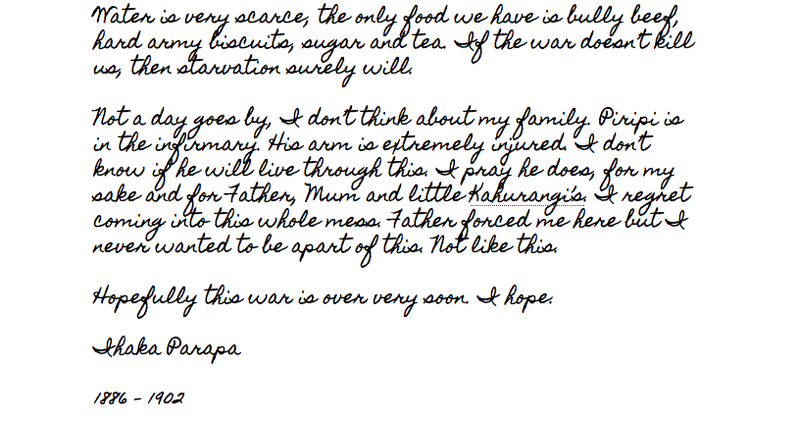 We were given a task to write a diary of what a NZ solider in the Boer War would be experiencing. Here is mine :) By the way, the following is completely fiction. Sorry if you can't understand the lettering. Who loves laughing, running and reading. Who hates annoying kids, over dramatic people and pointless movies. Who wants to go to London, France, Rome and Greece. Who is scared of falling, parents dying and friends dying. Who dreams of traveling around the world. Who is determined to become a soldier when older. Who values kindness, family and pure awesomeness. Who is proud of her achievements. Here is yet another DLO for my Maths work. This presentation explains Adding and Subtracting fractions with like denominators. Empathy is really important and to be honest, it’s a fairly complex topic. Although the simplest definition of Empathy is putting yourself in other people’s shoes and seeing their problems through their eyes. A LOT of people easily confuse Sympathy and Empathy. What is the difference between Sympathy and Empathy? I believe Empathy starts off as a feeling, this then leads to an action. A really good way to show Empathy is by discussing complications and connecting. Showing Empathy is as easy as caring for someone. Just by asking someone: “How are you REALLY feeling?” can make their day a whole lot better. Instead of confronting the person and their situation, Sympathy is feeling sad for the person and what they are going through. It doesn’t exactly build a connection between people but rather makes the whole point of pity. Empathy plays a big part in Tiaki Taonga, if everyone was empathetic, we would be living in a much better society and environment. Don’t you think?